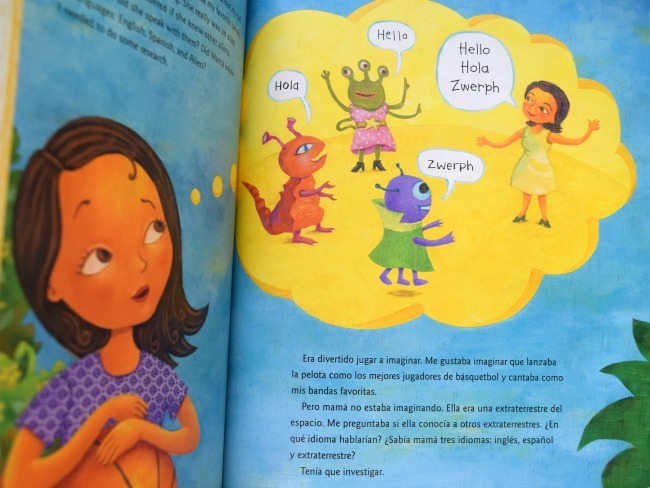 Today, I'm so happy to share with you a new children's book out by my friend, René Colato Laínez. If you haven't read any of his children's books to your children, you should go check them out (aff)! They are always top notch and so when I was asked to write a review of this book by Lee & Low as part of a blog tour, I was eager to accept. 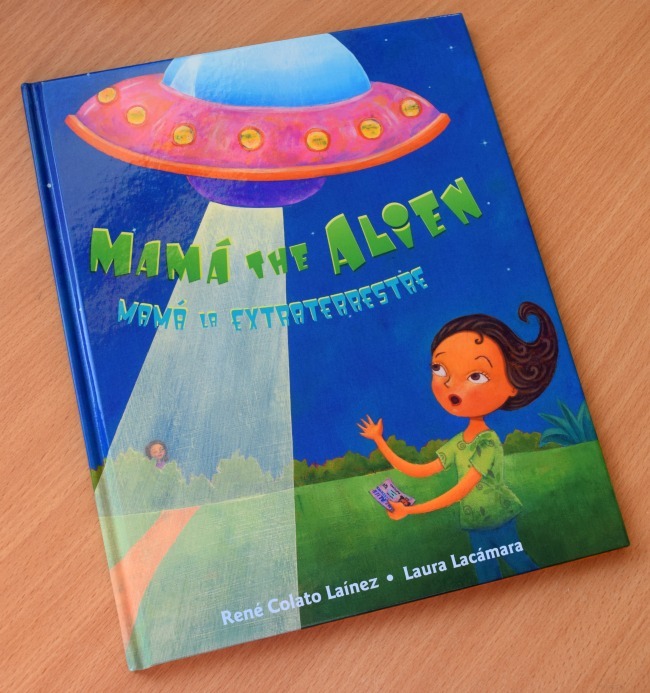 René's latest book, Mamá the Alien, Mamá la extraterrestre (aff), tells the story of how one day, Sofía makes an amazing discovery about her mother. When Sofia's basketball knocks over her mother's purse, a card falls out with the word "ALIEN" written across the top! 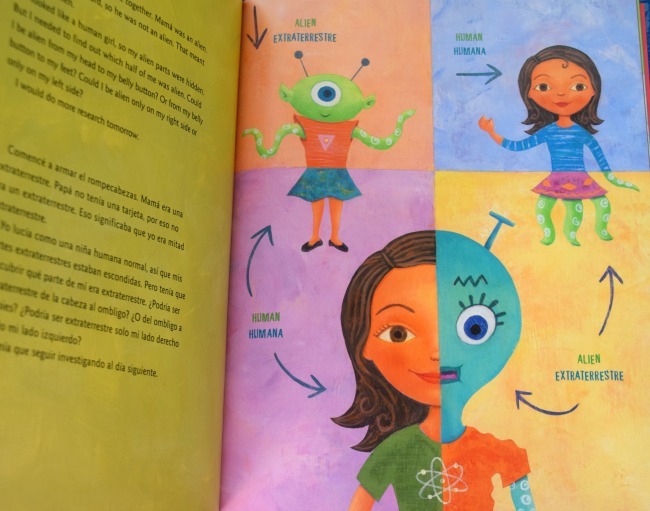 Sofia is astounded to discover that her mother is from outer space and begins to research extraterrestrials. She then begins to wonder about her own identity; does this mean she's half an alien, too? This story is a creative twist to the immigration theme. As you can see, Laura Lacamara's illustrations are simply phenomenal. I love how colorful this book is and how each illustration fills the page. It is warm and vibrant, and we couldn't wait to turn the page to see what came next. This book would be a great supplement for lessons on immigration, family, research, aliens, outer space, citizenship, and more. I couldn't resist creating a few printables to extend the learning. 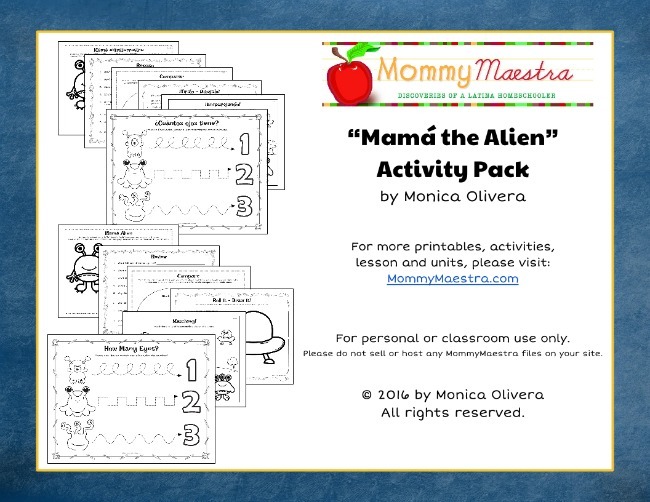 Inside this little packet, you'll find 12 activity sheets (6 in English and 6 in Spanish). They are divided into three levels; Level A is best suited for children 4 and under, Level B is for those 4 - 6 years old, and Level C is for those 6 years and older. 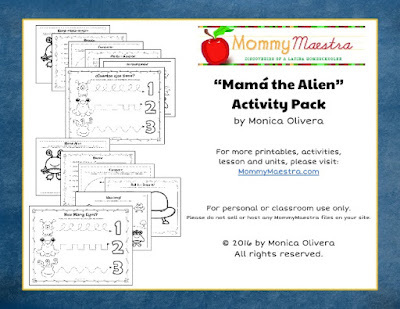 But as with all educational materials, you should use the sheets that best meet your child's skill level. I've been careful not to write ages on the sheets so you can choose whenever ones you prefer. The level is listed in the top right corner. They're just for fun, but do require your child to follow simple directions, do some reading, or writing. Lee & Low is graciously offering a copy of René's new book to one MommyMaestra reader. Wouldn't this be a fantastic addition to your home or school library? Disclosure: I was sent a copy of this book for review purposes. All thoughts and opinions are my own. I think that my kids would get a kick out of this story. I'm a bit of a sci-fi geek so this is right up my alley. I know my kids would love this book! I think that both my kids and my girlfriends' kids would all enjoy this book, educational and fun all at the same time. Thank you for the great resource! Hahaha I love the title! My son would get a kick out of this book. Thanks!